Why is it so difficult to say I love you sometimes? Or to be romantic, just for the sake of it? I don’t know if you’re like me, but I feel this unexplainable urge to be hopelessly romantic yet don’t always know how to express it in a way that feels right. Do you want to know what marriage and relationship experts agree on? They’re all constantly fighting with each other and everyone else about the right way to be in a relationship, and the right things to do, and the right things to say to each other. Take it from me – it’s exhausting. Saying ‘I love you’ to your partner is about as important as it gets. Take The Quiz: Are You Meant To Be Together? It’s all about communicating your love and positive regard to your partner often. And not just often – but in different ways. Some people are confused whether their partner loves them… because they haven’t heard ‘I love you’ in the right way yet. Not everyone wants to hear ‘I love you’ in the same way. Some people are more affected by metaphor, some people by example, and some people by beauty or wit (1). Love has a ton of crazy ways of expressing itself. Whatever it is – the ways people like to hear ‘I love you’ are infinite. Which is lucky for you… because there’s nothing that keeps the love and affection alive in a relationship like both partners firmly expressing love and commitment to each other – that really can make a relationship last forever . 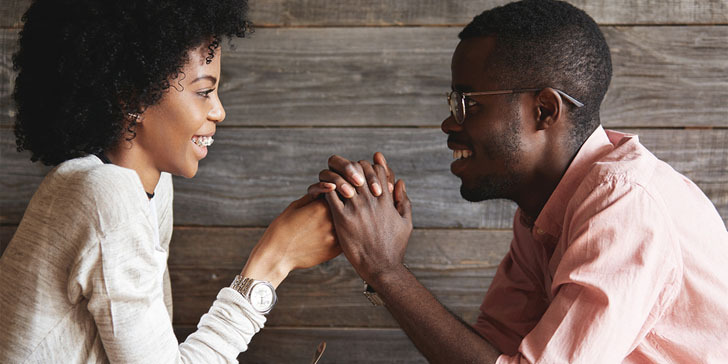 So if you want to make sure to keep your relationship strong, and you want lots of different ways of expressing your love (like a note tucked in his briefcase, or a short text, or even a heartfelt love letter) (2), well, we’ve got you covered. In this video, Erin walks you through some of the very best ways to say “I love you” and why they work so well. Watch it now, then keep reading to see our list of the most romantic 25 ways to say “I love you”! Every day I look at you and feel love and inspiration. If I were spelling out my favorite thing in the world, it’d be spelled ‘ y-o-u‘ (3). I don’t even want to think about what life would be like without you. Everything you do in my life adds to my happiness, subtracts from my sadness, and multiplies my joy! I can’t wait to spend the rest of our lives together. Sometimes I can’t stop looking at you… you look too damn good. You are the person I want to spend my life with – my soul mate. I can’t believe how perfectly we were made for each other. You are the sunshine in my day and the moonlight of my nights. I just wouldn’t feel complete without you. I cherish you above anything else in my life. I can’t believe how hard I’ve fallen for you. You make my soul sing when you walk into a room. I feel such powerful adoration for you and only you. You are my treasure – the most precious thing in my life. When I wake up, I’m smiling, because it’s another day with you. I will never love another person with as much intensity as I love you. How did you become the utterly amazing person that you are? You are the best boyfriend/husband in the entire world. I’m so excited that we have so much time to be with each other. To you – the only person I will ever love. I can’t say it enough – I love you more than anything. Sometimes a quote can express our love in ways our words cannot. It’s hard to understand your feelings when in love; these feelings can feel overwhelming and impossible to express. Yet at the same time, your heart might be heavy with the nagging sensation that you need to express yourself… and be heard. What I mean by being heard is you want the person you love to truly understand the depth of your feelings. One thing to pay attention to is that yes, saying I love you and being romantic is a good thing. Yes, it’s important. But it’s not the be-all-end-all of your relationship. Focus on the quality of the time you spend with him; not on what he says and what you say. 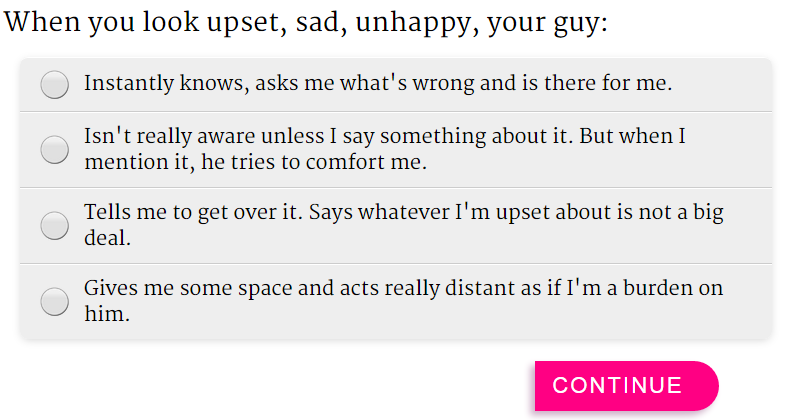 Over analyzing how to say I love you might blur the actual sentiment you’re trying to express. Sometimes you can say “I love you” by pushing him against a wall and “making love” to him, for example. Words do not have to be the only way to express love; men actually are going to feel your love even more with a physical expression. In fact, holding his hand or looking into his eyes is going to be a way to show live in ways that he might respond better to than anything you can say. If you love him, let yourself express it in a way that feels natural. If something feels natural, it will come across in a way that he can instinctively feel. Never force anything; trying to “force” a romantic exchange between you and him will only set you up for disappointment. In fact, one key point to always remember is: don’t look for him to respond to you in a certain way. Have no problem with how he responds. Listen to him and be fully present in each moment. Love is not something that has to always be defined. Love is. P.S. Have you watched our short video that exposes the most common mistakes you might be making that stop a man's love dead in its tracks... plus reveals exactly what to do about it? Click here to watch it now. I say I love you to my wife constantly, and she says it to me constantly: at least 5 times a day. We have been together for 30 years now and there is still a burning passion in the two of us. All of you people that think that saying I love you too often “takes away from it” or “cheapens” it have no idea what true love is. The words “I love you” are strong and beautiful like a diamond. And like a diamond, they can be used over and over again and not wear out. They aren’t an old set of tires on a beat up old pick up truck. I think there are no words to express feelings. Am gonna take my relationship to a next step with these expression.I noted them down..sounds pretty good. I love these and they help a lot, but I would like to see more flirty and powerful ones if you could do that. But otherwise AWESOME!! Thanks, It’s Very Helpful. I Wish My Gf Read This Thing. Some Girls Do Say I Love U But They Mean Different Things All Together. Girl: why are you always so nice to me? Boy: I’m not being nice…it’s just that…a girl like you deserves love, care and respect. it’s all husband/boyfriend.. all the quizzes are him/his/he/your guy. can we not? haha not everyone reading this is female and not everyone is ‘straight’. A majority of the world is straight…so its for the masses. Just replace the pronouns with your SO and voila, problem solved. If you don’t like it, write your own. Am not big giver .. !!! but Tell me the way to return the cosmic love you stored in my soul back to your eyes.!!! Wow ….super ….amazing line …. Someone, told me that I love you is understatement. The tips are good to go. some advice from an established blog. Is it very hard to set up your own blog? Someone once said to me they couldn’t understand why I put up with so much from them and my response was because I find that in those times “I love them more than I love myself.” They didn’t know what to say, but I notice they started doing better and appreciating my efforts more. Love is such an amazing thing that u feel it but hard to express it,and I always feel amazing when I read those kind of express words! On a daily average you heart produces enough energy to drive a truck 20 miles and the distance to the moon and back driving by a truck equals a lifetime(roughly 60-65yes)…. I love telling my wife I love her., I make her heart shaped toast, I always try new fun ways to let her know how very much I love her.. Being apart from someone you really love is difficult yes. Especially that all you can do is to tell him what you feel “I LOVE YOU”. Like you have to think of how to say it differently everyday but.. you wouldnt mind it anymore. What i best learned from love is that , if it is true, and if it is meant to be for the both of you , it will last FOREVER. So sweet! These are great ways to say one thing, without saying the words. I good way to keep the phrase alive and well in your relationship. Saying I LOVE YOU should be reserved for the times that you are truly in love with someone. I feel that many kids like to use the words way more than they should. By using the phrases that you have listed here, it seems that you can get the same message across without actually saying I LOVE YOU. Everyone has there own idea about how to have a good relationship. There shouldn’t be anyone judging and telling other people how to handle one. It is not easy to stick with one part of a routine for a long period of time. It does make the combo is better than any other option! Great post. Most guys would love a girl that is all about the I LOVE YOU’s, but I like it when other words can be used. I am the same way. If you can tell it to me in another phrase and without saying those words, I am totally going to be in love! I consider myself an expert at the I LOVE YOU phrase. These are great additions to what I know. I love you has become so common these days. Young people do not even know the words before they are saying to a partner. All of these are nice. It would be nice to hear them from a man for a change! Sometimes you have to surround yourself with the type of man that is willing to take the right steps and talk to a woman like this! If a man cries he isn’t weak he has a pure heart. If a man says I LOVE YOU he means it. If a man can’t say I love you he doesn’t deserve you. There are two types of men, realists and romantics, realists get lots of girls, romantics get one girl and that girl is the only one he needs. This is great. I love being able to say the same thing without always using the exact same words. It just starts to sound stale after a while. I wish my last b/f would have done things like this. He rarely ever told me that he liked how I looked or even just kissed my on the cheek for good measure. It’s too bad for him, I really liked him a lot. Romantic ways to say I LOVE YOU are a great way to let your partner know how much they mean to you! My parents say it to each other all the time and I could never figure out whey they were never bored with it. Then my mom explained that they didn’t want to be apart without saying because it might be the last time they see each other. Like many others here, I do not like to say it too much. The novelty wears off and then you are left with a bland statement. The best part that I like about LOVE and expressing it, comes when you do that one thing that really catches your mate off guard and they melt right in front of you! It helps that you have a guy that accepts this type of action, right? Otherwise it would seem like it is for nothing. Awesome! Being able to say I LOVE YOU without saying those words is really a true art. The ones that have mastered it have my attention all the time! I agree, I do not like the phrase going stale because it is said so often. These options keep that from happening. I love you is very romantic already, but I can see how some of these would sound even better than just using the actual words. Wow, page two has so many great ways to say I LOVE YOU that everyone could learn from them. I wish I was an expert in saying these words. Instead, they are something that I have yet to even hear spoken to me. Some people have it come naturally to them, while others have to be shown that this part of their brain does exist. I always held I LOVE YOU as an important part of any relationship. Once I was in one that was longer than short, I realized that there are different ways to say it. These are great. Saying I love you is one thing, but to be able to say it romantically is a whole other ballgame that you must learn. I was taught very early in my life that saying I LOVE YOU was precious and it should not be just tossed around. I choose to say it different ways and that is a great way to keep it from getting “cheap”. I agree! However, saying it too often takes away from what it means, right? That is what I feel. I am sure that every one takes that differently, but that is how I always looked at it.